May 2013 – Concurrent Technologies has released a further addition to their family of high performance VME processor boards. The VP 92x/x1x utilizes 3rd generation Intel® Core™ processors to provide high levels of processing and graphics performance and offers a very wide choice of front and rear I/O interfaces. By using XMC or PMC modules this I/O feature set can be further extended. With optional BIT and optional security features, the board is highly suitable for a wide range of new and existing applications within the defence, energy, scientific and industrial markets in particular. The VP 92x/01x supports the dual-core and quad-core 3rd generation Intel® Core™ i7 processors and Mobile Intel® QM77 Express chipset along with up to 16 Gbytes of ECC DRAM. The 3rd generation Intel® Core™ processor offers enhanced graphics and processing capabilities when compared to previous architectures operating within the same power budget. In addition, the 3rd generation Intel® Core™ processor extends itself to support compute intensive applications by providing support for OpenCL™. The board’s wide choice of I/O features include front panel DVI-D and VGA, Ethernet and USB interfaces with further graphics, USB and Ethernet interfaces via the rear connectors. Additional rear I/O interfaces include 8x GPIO signals, SATA and HD Audio. This I/O feature set can be further enhanced by adding one or two PMC or XMC modules directly to the board. VITA 31.1 Gigabit Ethernet on a VME64x backplane enables a tried and tested method of implementing a LAN-based multiprocessor architecture by leveraging readily available Ethernet hardware, TCP/IP software, clustering and other network management tools. As with many of the company’s products, the VP 92x/x1x is offered with or without security packages. This incorporates a number of user selectable and configurable proprietary security features deeply integrated into the board to prevent tampering and safeguard information. Optional front panel removable storage options (CompactFlash® or 1.8-inch Solid State Drives) are available using the company’s XMC storage modules – the XM 600/001 and XM 650/001. 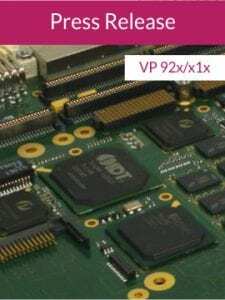 “The I/O interfaces on the VP 92x/x1x Single Board Computer have been tailored specifically to meet the requirements of our customers’ applications where, in particular, additional front panel graphics and Ethernet interfaces are required. This board will particularly appeal to today’s VME users looking to extend the life cycle of their existing systems and applications through enhanced processing and graphics performance”. All companies and product names are trademarks of their respective organizations. Intel, and Intel Core are registered trademarks of Intel Corporation in the United States and other countries.